The Station House is a Collingwood Motel owned and run by a little team of four. 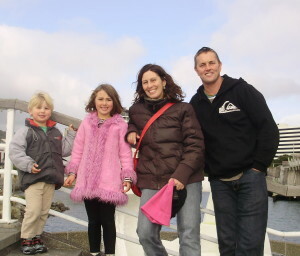 Darren is originally from Nelson, NZ and bought The Station House Motel in 2010 after living in Vancouver, Canada for 10 years. He returned home with his French Canadian wife, Sylvie, and daughter Jaimie. Darren and Sylvie soon after moving to Collingwood had their son Leroy, who was born at The Station House in 2011. 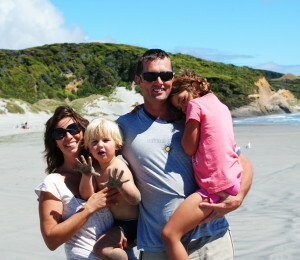 We have chosen to settle in our favourite region of Golden Bay and enjoy a peaceful lifestyle. We love Golden bay and know it to be a special region with incredible beauty, fabulous bush walks, a rich and interesting past as well as an abundant natural history. Our favourite places are Wharariki Beach, Milnthorpe Park, Devils Boots, Salisbury Falls, Kaihoka Lakes and for the best coffee and pizzas in the world, The Courthouse Cafe, which is located right across the road. Our children love living here in Collingwood and are getting really helpful in cleaning and running the motel. They will probably be knocking on your door calling out “Room Service!” as they deliver your milk for tea and coffee. They also love the days when other children stay and love sharing their trampoline, treehouse, sandpit and games room. We all look forward to making you feel welcome in our over 100-year-old home and cottage, and sharing our knowledge of our favourite and secret spots in what we think is a small piece of paradise. We hope you think so too! If you have any questions please feel free to call us on +64 3 5248464 or free phone within NZ on 0800 752 722 or email us at thestationhouse@xtra.co.nz or finally by sending us a message in the contact us form below.